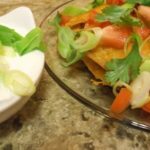 Spicy Jalapeno 3 Layered Mexican Pizza Wedges | Mexican Appetizers and More! The jalapeño got it’s name after the Mexican state of Xalapa or Jalapa. Back in the late 1990’s, we here in the United States faithfully devoted ourselves to growing and producing jalapeños. They are primarily grown and produced in southern New Mexico and Texas. On the “Scoville Scale” jalapeños measure 2,500 to 8,000 Scoville heat units (SHU) per pepper. Some may think that’s a lot but just know this, the hottest pepper up to date is the Carolina Reaper, measuring 2,200,000 SHU! I think we can take a little heat from our dear little jalapeño. So how do we make these yummy wedges? 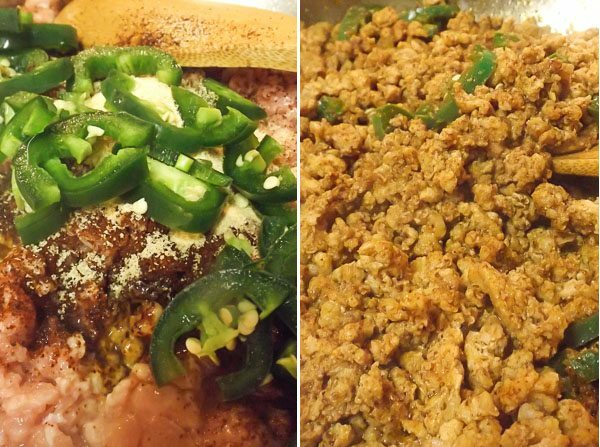 We first start with browning the ground meat with all the spices and the jalapeños. We set the meat aside and quickly cook the tortillas on each side for a few seconds in a few tablespoons of oil. Then heat the refried beans….heat in a microwave for a minute or so or heat in a saucepan for a few minutes. This makes it easier to spread the beans on the tortillas. Then spread refried beans on first tortilla. 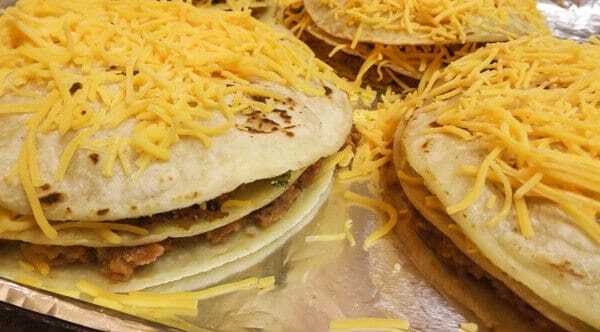 Top with second tortilla and add ground meat and cheese. Add the third tortilla and top with more cheese. Finally bake stuffed tortillas and cut into quarters. Top with tomatoes, scallions, avocado and cilantro. Note: You can also top these yummy wedges with black beans and black olives if you would like. So yummy! In a large skillet brown the ground beef over medium heat. Break beef apart with a spoon or spatula as it's cooking. Add chili powder, garlic powder, salt and jalapenos. Stir. Cook for another few minutes and set aside. Heat the refried beans in saucepan or microwave and stir several times while heating. Heating allows for easier spreading on tortillas. In a large skillet add the oil and heat over medium heat. 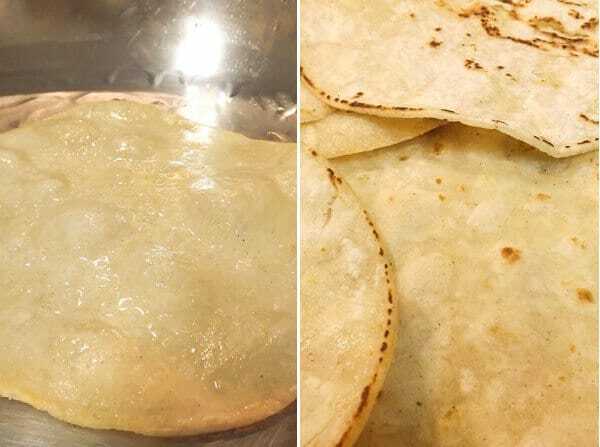 Cook corn tortillas until they are slightly brown on both sides. About 10 seconds on each side. Drain on paper towels. Spread out 4 tortillas on a cookie sheet. 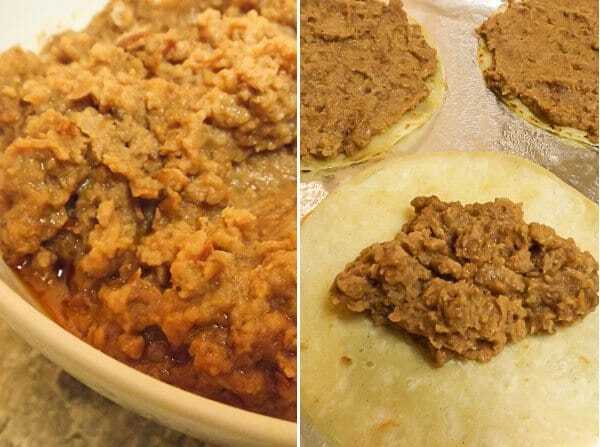 Spread refried beans on each tortilla to cover. Place a second layer of tortilla on top of each. 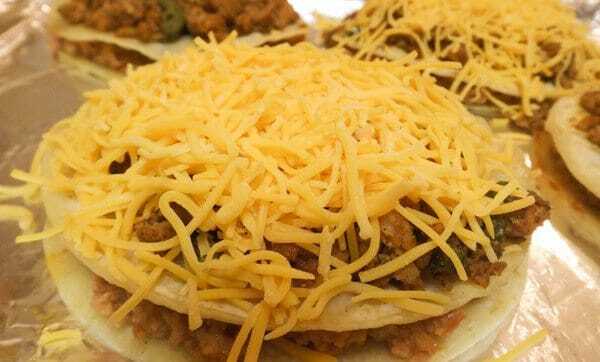 Add ground beef and cheese on each second layer. Top each one once again with another tortilla. Sprinkle with more cheese and bake for 15 minutes in oven at 350 degrees (175 degrees C). When the pizzas are done, cut each pizza into wedges or quarters. 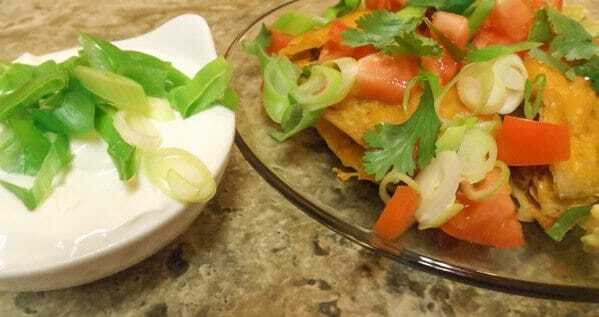 Garnish with lettuce, tomatoes, scallions, avocado, chopped cilantro and sour cream. Top with black beans and black olives if using. Place on a platter and serve warm. Enjoy!